Photo: Students from one of our orphan homes are excited about the education our program affords them. In continuation of our mission to develop sustainable in-country programs, we are planning to convert an old farmland facility into an income-generating rental property consisting of 15 apartments that will be available to low-income renters. Currently, our 14-acre rice farm provides food for 140 orphans, the staff in our six orphan homes, and dozens of indigent elderly widows under our care. In years of surplus, the harvest generates income for our programs. 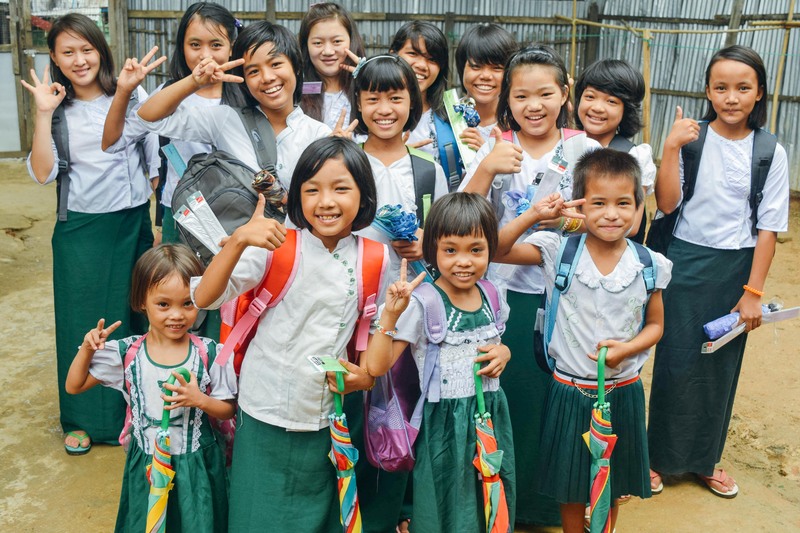 In years of drought or flood, rental income from the apartment complex will protect our Myanmar education programs from losing crucial funding. To retrofit the old facility, we are seeking to raise $7,500 ($500 per apartment) which will cover the building materials of cement, sand, aggregate, wood, tile, plywood, bricks, nails, electrical wiring, tanks, pipes, and labor charges. In just two years, the project will recoup itself and generate income to educate our orphans. The annual profit on each apartment will be $240, which pays for an entire year of education for one orphan. We will begin construction when we have acquired full funding, and the apartment complex should be completed in one month. Photo inset: (Top-left): Girls in one of our Myanmar orphan homes joyfully display their new school supplies and clothing. (Top-right): A farmer works on preparations for our 5th rice harvest at our farmland. (Bottom-left): Bags of rice from our last harvest are delivered to our Myanmar orphan homes. (Bottom-right): We recently partnered with a new local orphan home in Myanmar to provide for 5 more children in need. In other news, preparations for our 5th rice harvest at our farmland are underway and going well. We are praying for fair weather and looking forward to harvesting several tons of rice in November. This dietary staple provides the children with fast and instant energy, regulation of digestion, stabilization of blood sugar levels, fortification of the immune system, an essential source of vitamin B1, and it also provides protection against dysentery, cancer, and heart disease. Another benefit of our rice cultivation is that one 50 kg bag of rice retails on average at $38 in the market, thus our last rice harvest saved us $4,180 from not having to buy the same amount of rice from the market, and $4,180 is a big deal in Myanmar — it’s equal to about 5 year’s worth of wages. We are also thankful to report that we recently partnered with a new local orphan home in Myanmar to provide for 5 more children in need. With this new orphan home, our native team is now operating a total of six orphan homes, caring for 137 children. Two of the houses are owned by local leadership, but four of the homes are rented, requiring them to pay 6 months rent in advance per the local custom. With your support, we are seeking to raise $150 per month to cover the rental fees. There’s so much we’re thankful for about our progress in Myanmar so far in 2016. Thank you for being a part of this work — the ultimate harvest of which is rescued and transformed lives.